The ultra portable Pico Genie M550 Plus (includes 2 pairs 3D glasses) is the world’s brightest portable shorter throw HD LED projector with inbuilt battery (up to 3 hours!) at an amazing 650 ansi lumens (3900 marketing lumens). It works well with Apple products and also has an in-built computer with Android Operating System (OS). It offers extensive wireless connectivity to most devices including Apple and Android. This projector has everything you could ever need in one small portable device with an image quality good enough to be used in any normally lit environment. Overall the M550 Plus offers simple & easy wireless mirroring with most devices including Apple and Android. It has one of the widest numbers of connectivity options including USB, Micro SD, HDMI, VGA (standard), AV, Wireless Audio to connect external audio speakers as well as 2 USB ports to control keyboard/mouse plus a wealth of other useful features. Ultimately this device can be dropped into any situation so you can start projecting for long periods without even needing to connect it to mains power. The Pico Genie M550 is truly an all- round projector! 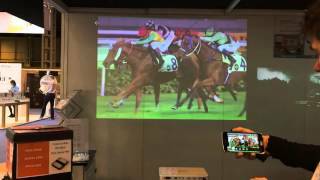 The NEW ultra portable Pico Genie M550 Plus with 2 Active 3D Glasses is the world’s brightest portable shorter throw HD LED projector with inbuilt battery, wireless mirroring with Android built-in plus many more desirable features. The PLUS model now also includes a wireless keyboard and has one of the easiest wireless mirroring systems on the market (for most mobile devices including Apple) as well as apps like Netflix onboard** . The M550 Plus offers excellent image quality at 650 ansi lumens (3900 marketing lumens) and uniquely has battery power lasting up to 3 hours. The image is also shorter throw than the average LED projector meaning it creates a much larger image closer to the wall so if you are limited on space in a room or just want to get the biggest image possible its throw ratio is much better than average and double the size of some competitor products in the same ultra portable projector category. These glasses are feather light and designed to fit over most standard glasses to ensure everyone can experience comfortable 3D projection. Connectivity is extensive and includes an Android OS as well as wireless mirroring options for most smartphones including Apple, Android and Windows. Supplied with a Radio Remote Control so you can command your projector from anywhere, don’t worry about not being in range! 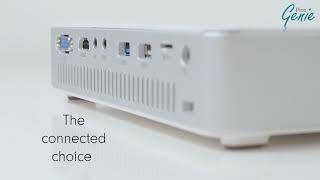 There are a wealth of other options including wireless audio, USB x2 ports, VGA, HDMI, SD, USB, Wifi. Includes option to connect a wired or wireless keyboard/mouse to control the projector or surf the net via the Android Interface (see specification for more details). Powerful 3 watt stereo speakers are also built into the device and are amongst the loudest inbuilt speakers available on a portable projector at this weight. The M550 Plus works with most devices including Apple devices so its connectivity is sure to tick all of your boxes! Ultimately the Pico Genie M550 Plus is bright enough to be used anywhere in almost any situation anywhere, allowing ultra bright images to be projected even on battery power. The Pico Genie M550 Plus is a truly all- round projector suitable for almost any user! - Stream your Smartphone/tablet wirelessly at 200"
- Micro SD - No need to connect a PC! * Wireless mirroring to Android is only supported by Miracast enabled Smartphones/Tablets.